Stop wasting time looking for your cosmetics, I know, you’ve lost count of the number of times you couldn’t find that bright red lipstick that goes with that black dress. Good news is, you will never have to worry about this ever again! Our Magic Cosmetic Pouch is designed to help you solve all of these troubles and simplify your life. 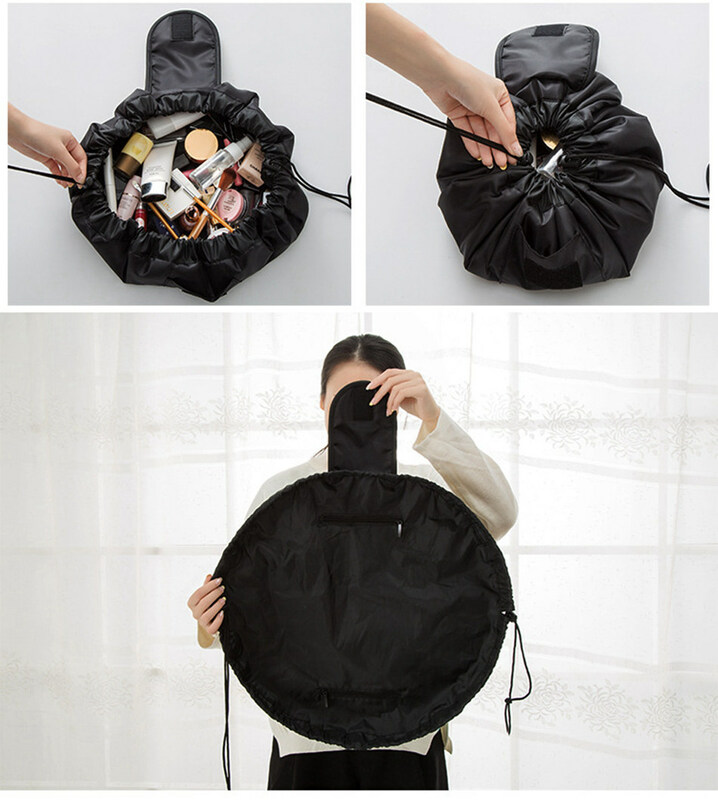 When you open the drawstring, the bag layout completely flat within seconds, you can see all of your toiletries and cosmetics at once.No more digging and dump in a traditional black hole makeup bag. Easy to find everything. The outside has a mini pocket, the Inside has two zipper pocket, which can be respectively provided with small beauty tools, sharp cutting eyebrow clip or cosmetic cotton and so on. Solve the trouble of carrying small items. Unfold size: it is enough to put all the daily essentials into the single bag. Foldable, portable and lightweight, easily put it in your backpack or luggage. Made of high-quality Oxford cloth, dirt resistant and easy to clean. You can use it as a toiletries bag, storage bag, travel bag, the bathroom receive bag, makeup receive. Put all of the toiletries in the bag, tighten the two lines drawstring, quickly pack. Close the outside velcro, prevents the tiniest of your items from falling out. If you’re in a hurry you don’t even have to open the bag fully- pull the drawstring halfway and grab what you need. makeup bag can be worked as a cosmetic bag, toiletry bag, and jewelry bag etc.